Introduction: levetiracetam (LEV) is an anticonvulsant medication with an unknown mechanism of action. The majority of adverse effects are of mild to moderate intensity, being rhabdomyolysis (RBM) one recently described, with few cases reported in the world. Description: the case of a 35-year-old man with a history of obesity and generalized epilepsy without treatment is presented. He had an epileptic status controlled with benzodiazepine and LEV satisfactorily. Neurological examination and simple skull tomography ruled out associated alterations. He had acute renal injury due to RBM that despite controlled epileptic status and management with dialysis support, progressed towards deterioration. RBM by LEV was suspected after having discarded autoimmune etiology and RBM by immobilization of obese patient. The LEV was suspended showing a rapid decrease in creatine kinase (CQ) and progressive improvement of the acute renal lesion, thus confirming the diagnostic suspicion. Weaning and withdrawal of dialysis support was achieved, and was discharged from hospital with normal renal function and CQ, prescribing valproic acid as anticonvulsant and a contraindication warning for management with LEV. Discussion: LEV is an antiepileptic whose most frequent adverse effects are: drowsiness, dizziness, irritability, headache and fatigue. 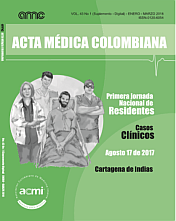 The RBM by LEV is an infrequent adverse effect (few cases reported in the world and none reported in Colombia). European society included this adverse effect recently within the LEV labels. Its treatment is based on suspending the medication and administering support therapy, as well as close clinical follow-up.